I want to go to Ireland. I need to know how much money to save up for the trip. How much is a round trip plane ticket? How much will the whole the trip cost? Let me consult my crystal ball! Pricing for a trip to Ireland depends on many different factors. Will you travel with an organized tour, which includes most things such as airfare, coach travel, lodgings & meals? Will you use public transportation such as trains and buses? Will you travel independently and drive yourself around? Will you hire a chauffeur-driven car? Michele’s Advice:If you opt for an organized tour start your research online for tour companies and check with your favorite travel agent. Many times booking well in advance will get you a discount. 1.Know the Currency. Currency in the Republic of Ireland is the euro, which uses the following symbol: €. Each euro consists of 100 cents. Notes are issued in 5, 10, 20, 50, 100, 200 and 500 euros. 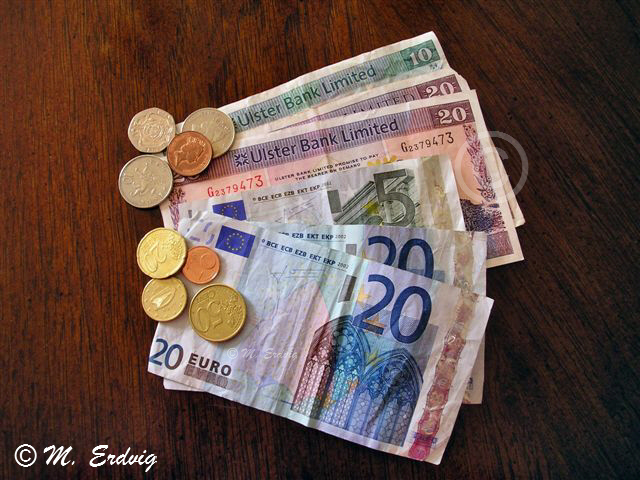 In Northern Ireland the currency is the British pound sterling, divided into 100 pence. The two currencies are separate and not interchangeable. You cannot use US dollars or other foreign currencies in Ireland. Sometimes areas near the border of NI & ROI will accept cross currency. 2. Cash. Do not bring $100 bills.Instead bring lesser denominations. Because of the high incidence of counterfeiting Irish banks won’t cash them. It is best not to travel with too much cash since it can easily be lost. Bring enough to cover any travels en route to Ireland and back home. Once in Ireland use the tips below. The Blasket Islands float dreamily off the tip of the Dingle Peninsula. Once inhabited by hardy islanders who lived off the land and sea, they were not only farmers and fishermen but dreamers, storytellers and poets. Their literary works remember a lost way of life that existed before the dwindling population was relocated to the mainland in 1953. The haunting Irish tune Port na bPúcaí (Music of the Fairies) is thought to be the islander’s interpretation of the songs of the whales that they heard through the thin hulls of their currachs – skin or canvas-covered boats. On my first trip to Ireland my husband and I butchered the pronunciations of Irish towns, counties, provinces and sightseeing venues. The locals looked at us like we were crazy till we pointed at the name on our map. To their credit, most of the Irish were pretty subtle about correcting us. “Oh, you mean Dromoland.” And then the man proceeded to direct us to the castle. The one that has kept me in stitches after all these decades is the way my husband pronounced Youghal, a small town in Co. Cork. Now, he is originally from Brooklyn NY so I can understand him saying, “Yo! Gulls!” as if he was greeting seagulls. We later learned it is pronounced like the name of a small boat – yawl. 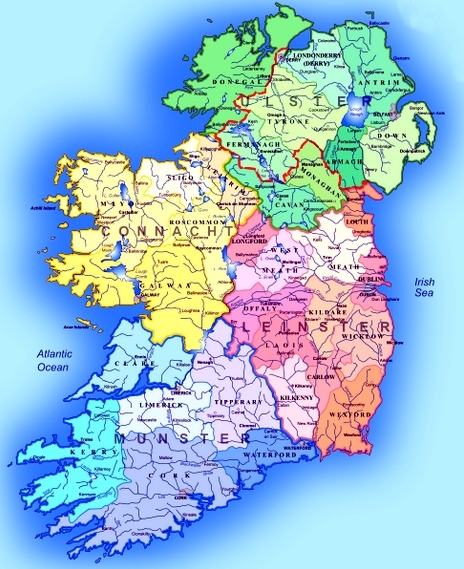 Since 1973 and with over 50 trips to Ireland under our belts we are slightly better at pronouncing Irish place names. However, each and every time I visit Ireland I learn something new and how to pronounce very obscure locations. When I learn a new pronunciation I write it down phonetically and then practice it till I get it right. I’m sure I test the patience of each kind Irish person who very patiently helps me with this process. Just today while surfing the web I found an online site for pronouncing words. 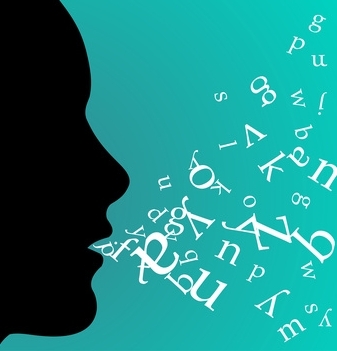 You can actually listen to the words being pronounced. Unfortunately, some of the pronunciations on that site gave me the giggles. Take a listen and let me know what you think. 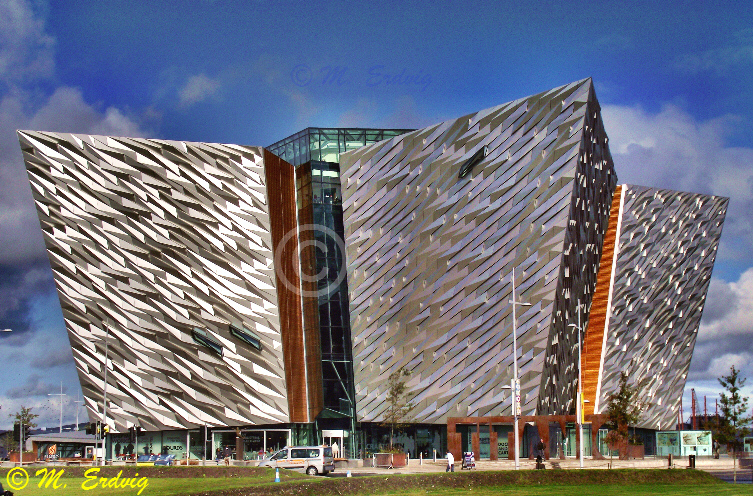 Titanic Belfast is a distinctive silver-clad edifice perched on Belfast’s docklands near where the Titanic was built. 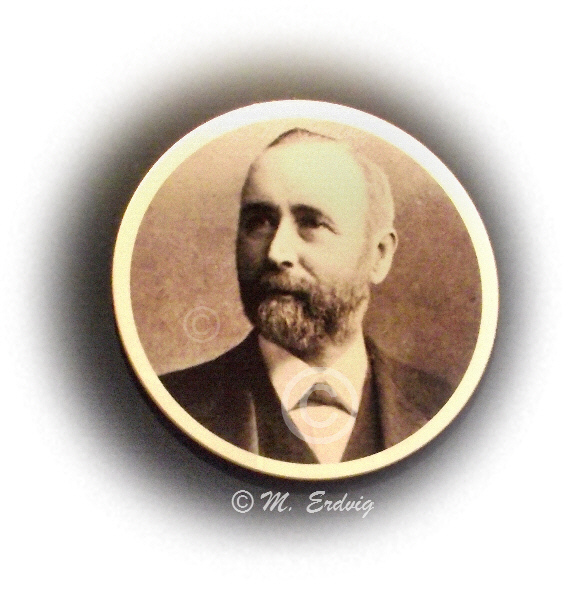 The White Star Line insignia, ship hulls and ice crystals inspired its unique architecture. An aerial view reveals its star-shaped design, while those approaching it on foot will be impressed with its four jutting faceted aluminum prows that look like abstract sculptures. Locals have nicknamed it “the Iceberg”. Throughout its six stories the exhibit explores the iconic doomed ship, the Titanic, from its creation in Belfast, through its launch and maiden voyage to its tragic fate and aftermath. The main focus though is the building of the behemoth ship. 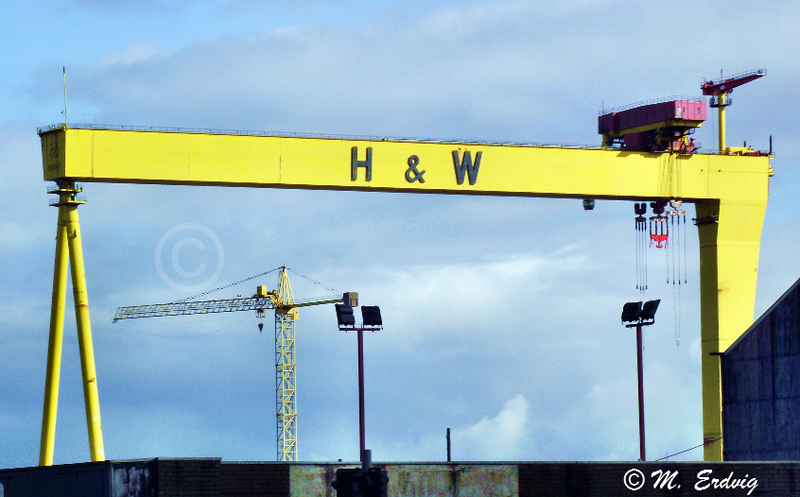 You start in boomtown Belfast with an overview of how it changed from a small town to bustling industrial city. 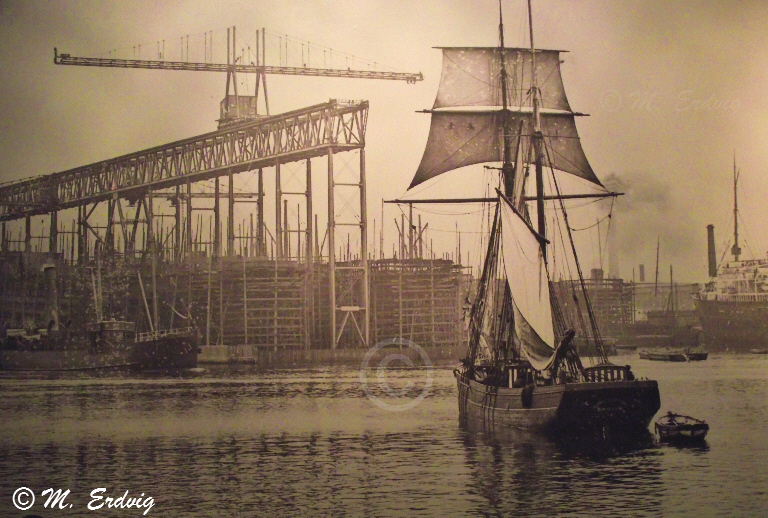 Shipbuilding, the linen trade, ropeworks, tobacco, tea and engineering each added their own layer of enterprise. Then a ride takes you through the shipyard, showing the innards of the Titanic, how it was built and depicting the stories of the men who built the colossal ship. 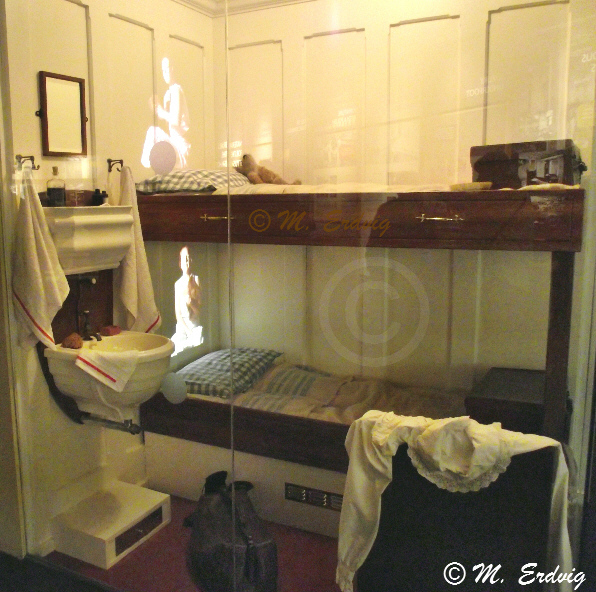 Storyboards, photos, films, models of the ship’s interiors, interactive exhibits and the graveyard of the Titanic displayed under a glass floor flow throughout the exhibit. 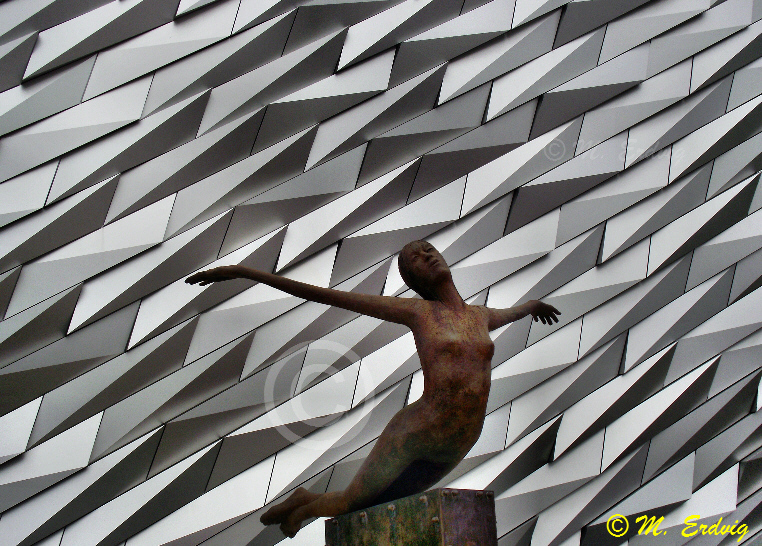 Every aspect is explored: Belfast City, the shipbuilders, the construction, launching and sinking of the “unsinkable” Titanic to the aftermath that gave way to countless myths and legends. There is a replica of the Titanic’s staircase, which is only open periodically. The philosophical Belfast residents sum up the catastrophic sinking with, “She was fine when she left here”. For all its razzle-dazzle the experience was a bit of a letdown. I felt it needed an infusion of heart and spirit to enliven one of history’s most fascinating tragedies. 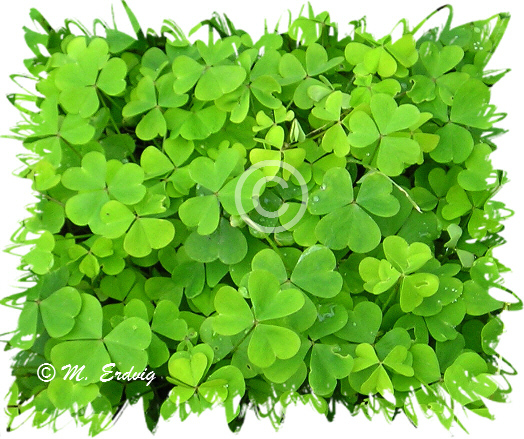 Soon people worldwide will be celebrating St. Patrick’s Day and the wearing of the green. Green beer, dying rivers green, flooding the Pyramids and Las Vegas with green spotlights – those who are Irish or Irish at heart will be partying hearty and ignoring Kermit the frog’s advice “It’s not easy being green.” On March 17th it is all too easy to be green. 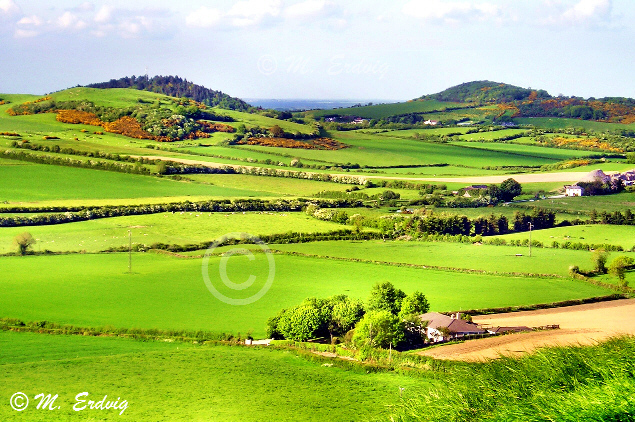 Ireland is renowned as The Emerald Isle because of its spectacular green landscapes. 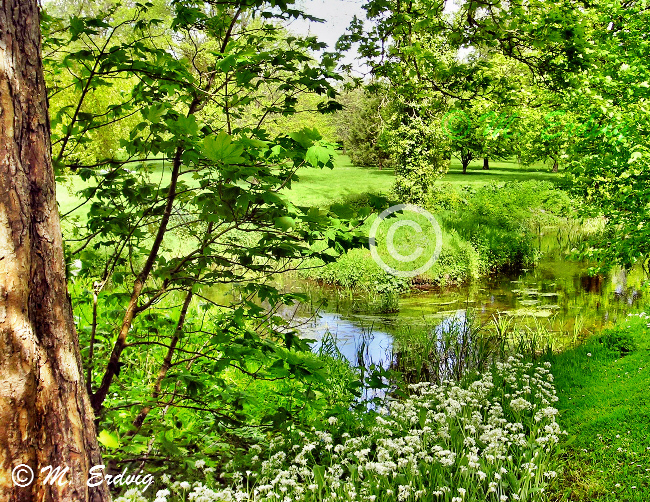 Singer Johnny Cash was so enchanted with the small green island that he penned his famous song Forty Shades of Green on a visit to Ireland decades ago. But are there really forty shades of green? Gaze upon a few photos I’ve taken around Ireland and make your own decision. Look at my list of 78 shades of green and see if you can come up with even more. 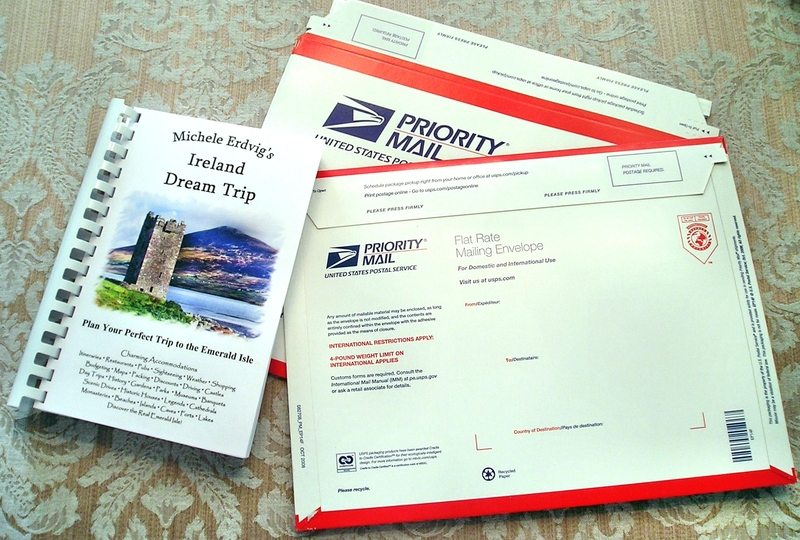 I am happy to announce the 2012 edition of my book Michele Erdvig’s Ireland Dream Trip is now available. Called “the BEST GUIDEBOOK ON THE PLANET!” by my readers, the new edition is completely up to date with the freshest info available in a published book. I have written this very personal guide to be your best friend as you travel around the Emerald Isle. Covering the Republic of Ireland and Northern Ireland, Ireland Dream Trip takes you to tourist hot spots, directing you to the best places to stay, where to get a great meal on a budget, fun pubs and excellent sightseeing. Looking for quirky, off-the-beaten-path places that are well worth seeing? I describe wonderful hidden gems that only the locals know and you will not find in any other book. In over 38 years of traveling continually to Ireland I have sought out the finest and most unique things in every category just for you. What makes Ireland Dream Trip unique? What is inside Ireland Dream Trip? 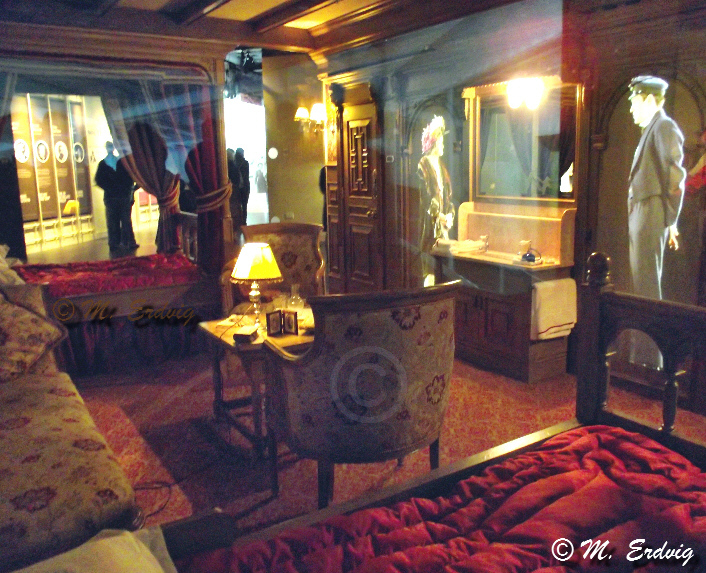 I invite you to Read an excerpt of just one of the fabulous and unique places I recommend for you to stay in Ireland. My book is full of many others and is your introduction to the real Ireland of the welcomes. 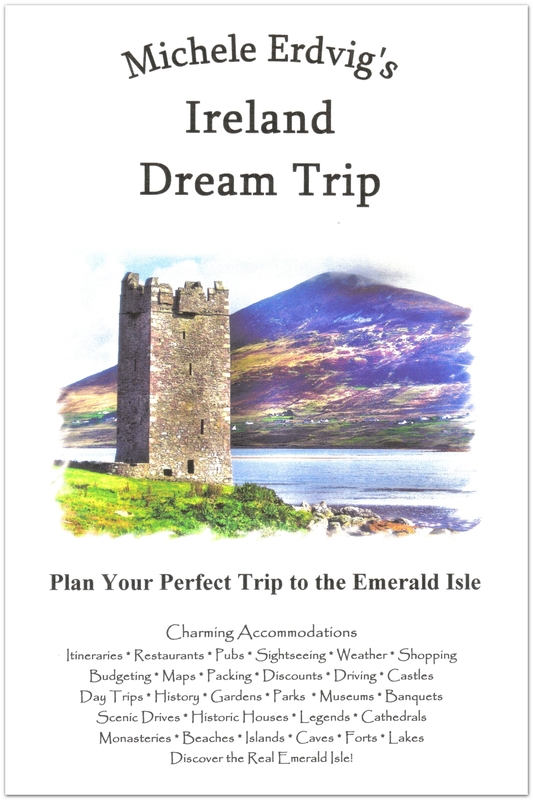 Is Ireland Dream Trip the right book for everyone? No. There is no one guidebook that is right for every person and circumstance. Those who plan on backpacking around Ireland staying in hostels or campsites will want to choose another book. For ordering info CLICK HERE. Your book will be sent immediately via priority mail. In the lower 48 states you should receive Ireland Dream Trip in 2 – 3 days. When I am in the States I personally oversee every order. And when I am traveling in Ireland I have a quick and reliable mailing service. 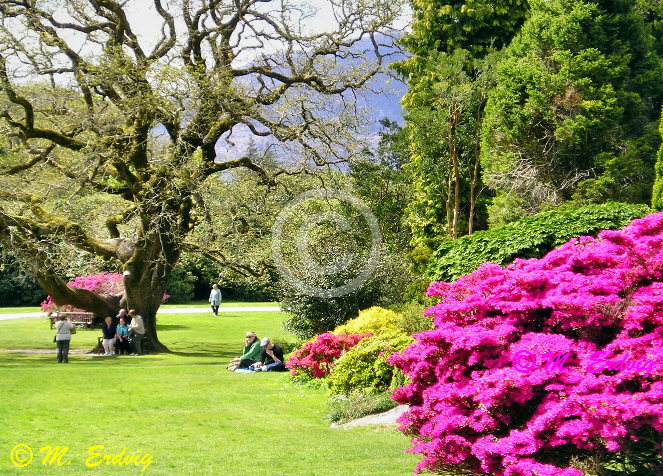 Although Ireland Dream Trip will give you all the resources you need to plan your trip, if you happen to find you have another question – no matter how difficult or simple – I am always available on my Free Ireland Travel Forum to help you. We have a wonderful online community of generous and helpful people willing to share their tips and trips with you. Please consider this my personal invitation to join in the fun we have helping with the trip planning process. 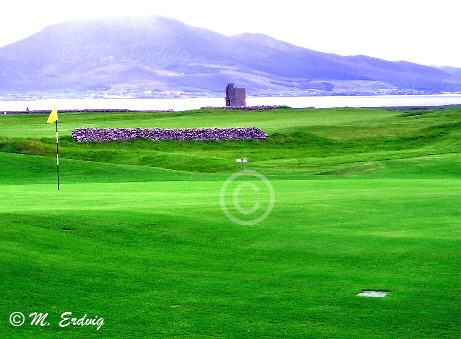 Who knows, perhaps you too will become addicted to the beautiful Emerald Isle. 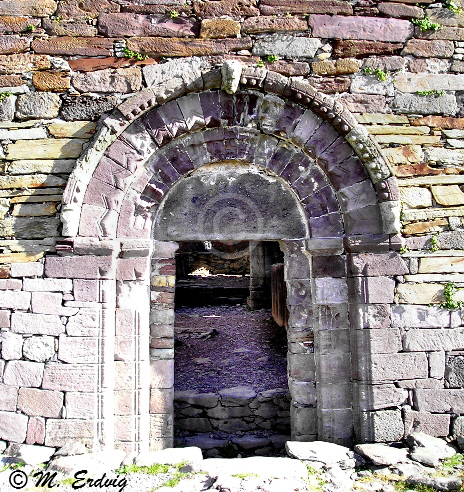 Kilmalkedar Church is a 12th century Hiberno-Romanesque ruin not far from Gallarus Oratory on the R556. 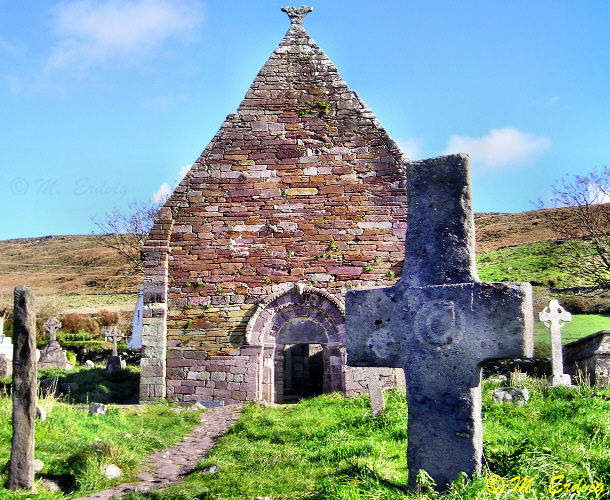 The now roofless church was founded by St. Maolcethair in the 7th century but is also associated with St. Brendan the Navigator. 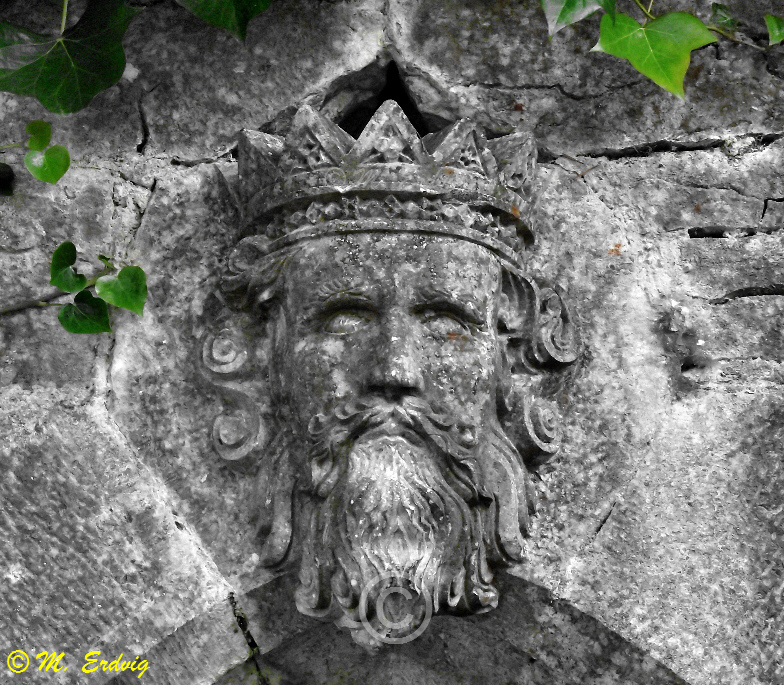 There are some fine carvings around the arches and on the surrounding stones. The Alphabet Stone is inscribed with Ogham and Roman alphabets. An ancient sundial contains a hole and many carvings. 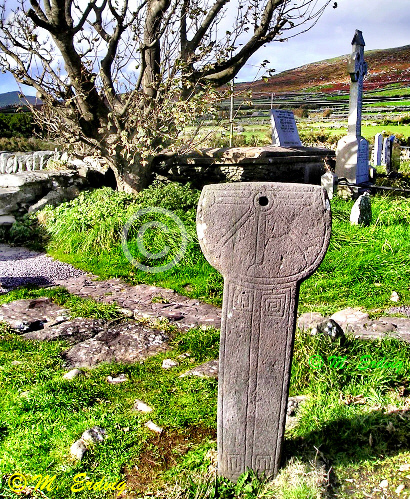 Legend says the tall holed Ogham stone was used to seal a bargain. Today those renewing marriage vows touch fingers through the hole in the stone. Free admission. Always open. 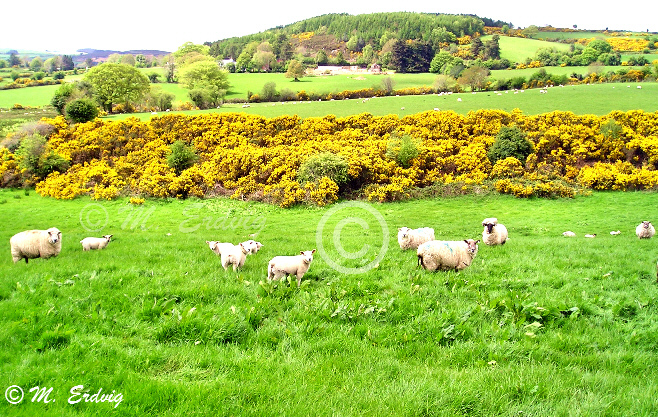 This is the last Ireland Friday Freebie for 2011. Last Friday we strolled along the river and through Cong Woods. 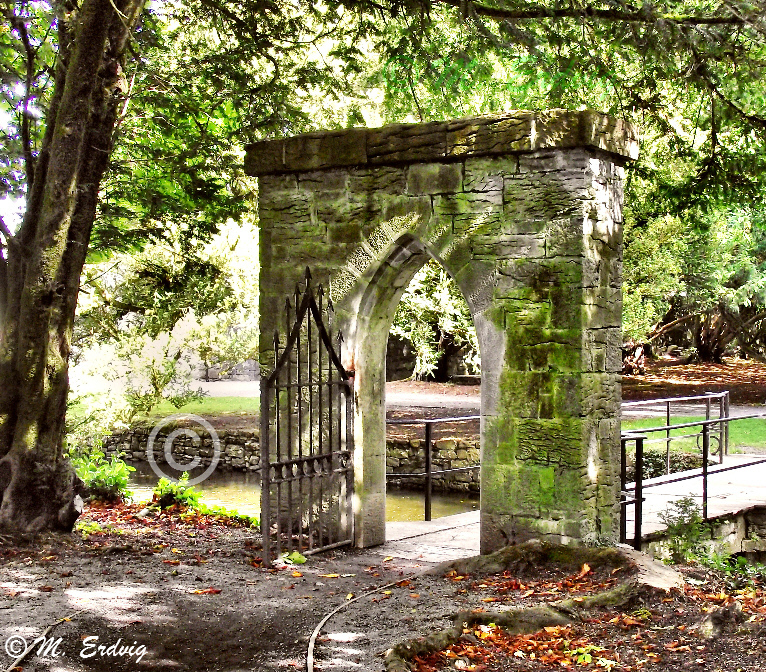 Since Cong Abbey is adjacent to the woods I thought another visit to Cong would compliment the area. 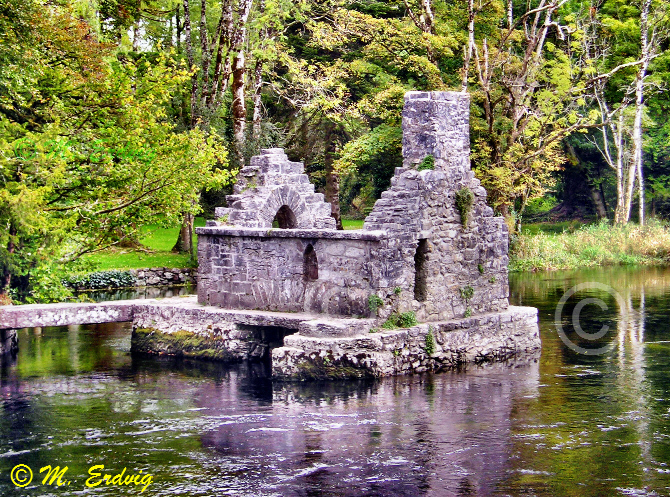 Cong Abbey is a serene ruin set beside the river in Cong village, Co. Mayo. 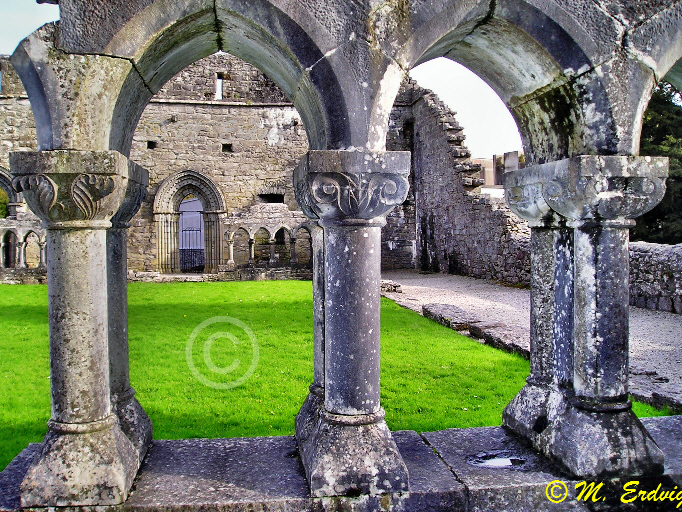 Originally the site of a monastery founded by St. Feichin in the 7th century, the present structure was built in the 1120s by Turlough Mor O’Connor, High King of Ireland. 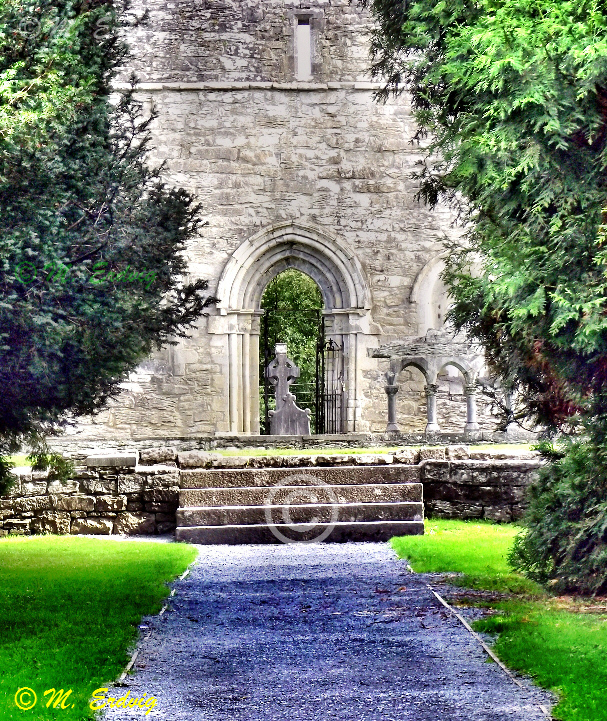 Rory O’Connor, the last High King of Ireland was buried there in 1198. 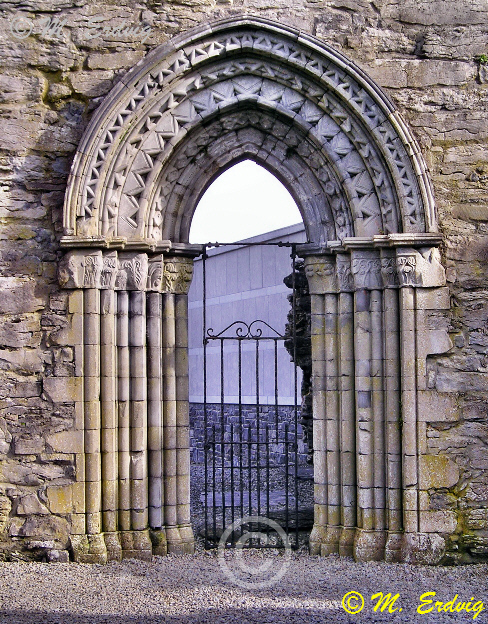 Part of the cloister, several doorways and some nice carvings remain. But the most interesting building is the Monk’s Fishing House on an isle in the river. Though roofless now, it must have been warm and cozy centuries ago, for it has a tiny fireplace and a hole in the floor to fish through. Open daily. Free admission.